Precious objects of this type were recorded in inventories of church treasuries and collectors cabinets. These rooms or series of rooms held unusual or intricate arrangements of rocks, shells, ivory, clocks, or microscopes, displaying the wonders of nature and science. Scholars and wealthy patrons collected intricate objects such as this carving to display in their collections and for private devotion. 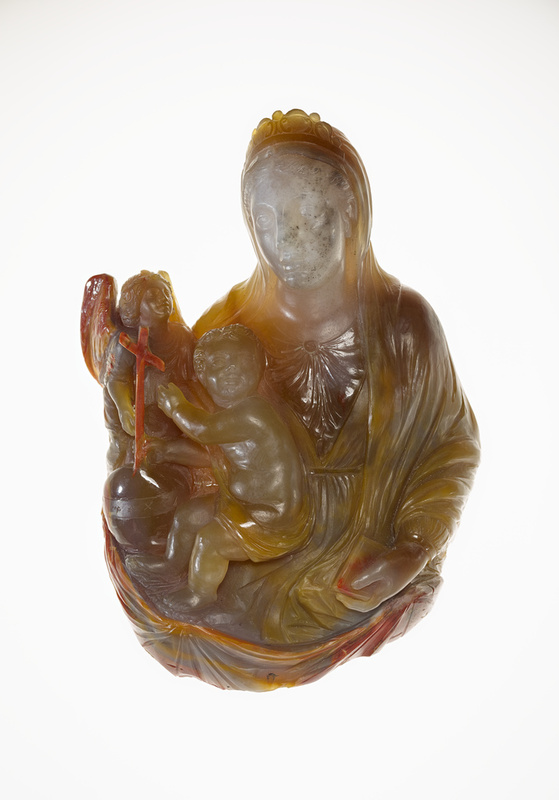 An unknown sculptor carved this extraordinary work from a single mass of chalcedony, a type of quartz favored by gem engravers. The folds of the Madonna's cloak form a fluid frame that surrounds and encloses the Christ child, angel, and orb against her breast. The sculptor used the red matrix of the chalcedony mass to highlight specific parts of the image, such as the cross, the angel's wing, the gospels, and the edge of the cloth.